Above: From left, we are: my father, Ioannis, Stella Kordoutis; my sister, Filisia; Irini Timotheos, me and my mother, Anna (Kiniklis). The children are Stella’s. 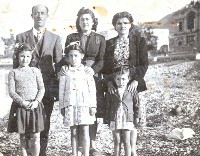 Above Right: Our family moved to Mytilene for two years; this photograph was taken in 1947. Next to my parents is Calliope Yiagtzis. Above: Our big group of friends; I am standing first from the left, while my sister, Filisia, is standing first from the right.